Kick off your visit on the 18th (Thu): explore the world behind art at Queensland Art Gallery and then let the kids burn off some steam at South Bank Parklands. Get ready for a full day of sightseeing on the 19th (Fri): identify plant and animal life at Lone Pine Koala Sanctuary, get great views at Mount Coot-tha Lookout, and then stop by Noosa Chocolate Factory. 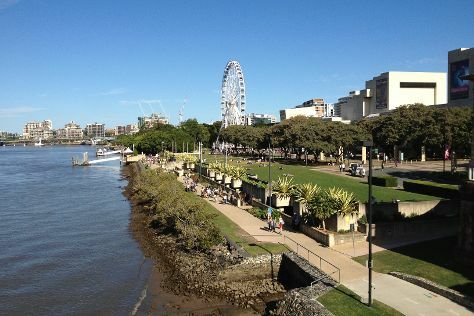 To find other places to visit, where to stay, maps, and tourist information, you can read our Brisbane online trip builder . If you are flying in from United Kingdom, the closest major airports are Brisbane International Airport and Gold Coast Airport. In July, plan for daily highs up to 24°C, and evening lows to 11°C. You will have some time to spend on the 20th (Sat) before leaving for Noosa. Explore hidden gems such as Queens Park and Spas. Venture out of the city with trips to Point Cartwright (in Mooloolaba), Buderim Forest Park (in Buderim) and Marcoola Beach (in Marcoola). Spend the 21st (Sun) exploring nature at Noosa National Park. There's more to do: pause for some photo ops at Mary Poppins Statue and take some stellar pictures from Laguna Lookout. To see ratings, more things to do, where to stay, and tourist information, you can read our Noosa online holiday maker . You can drive from Brisbane to Noosa in 2 hours. Alternatively, you can take a train; or take a bus. Finish your sightseeing early on the 23rd (Tue) so you can travel to Airlie Beach. You'll explore the less-touristy side of things at Kayaking & Canoeing and Bicentennial Walkway. Take a break from Airlie Beach with a short trip to Horseshoe Bay in Bowen, about 1h 20 min away. Spend the 25th (Thu) among aquatic life with a scuba or snorkeling tour. There's much more to do: indulge in some personalized pampering at some of the best spas, take in the exciting artwork at Above & Below Photography Gallery, and get interesting insight from Tours. For other places to visit, ratings, traveler tips, and more tourist information, go to the Airlie Beach trip maker site . You can do a combination of bus and flight from Noosa to Airlie Beach in 10 hours. Other options are to drive; or do a combination of train and bus. Expect a daytime high around 24°C in July, and nighttime lows around 20°C. Cap off your sightseeing on the 27th (Sat) early enough to travel to Cairns. You'll discover tucked-away gems like Historic Village Herberton and Michaelmas Cay. Venture out of the city with trips to Port Douglas (Scuba & Snorkeling & St Mary’s by The Sea chapel), Shannonvale Tropical Fruit Winery (in Mossman) and Humpy Nut World (in Atherton). The adventure continues: admire all the interesting features of Gallo DairyLand, hit the best photo ops around with an inspiring photography tour, view the masterpieces at Bones and Jones, and pause for some photo ops at Cairns Cenotaph. To see other places to visit, reviews, photos, and tourist information, read our Cairns trip itinerary app . Getting from Airlie Beach to Cairns by combination of ferry and flight takes about 5 hours. Other options: do a combination of bus and flight; or drive. Traveling from Airlie Beach in July, you will find days in Cairns are a bit warmer (30°C), and nights are about the same (20°C). Finish your sightseeing early on the 30th (Tue) so you can travel back home.